After a memorable tour of Australia, India is set to square off against the Kiwis in what is expected to be a cracker of an ODI series. Both sides are coming off a series win. While India defeated Australia, 2-1, the hosta swatted aside Sri Lanka comfortably by a margin of 3-0. This series will give both teams' an opportunity to address whatever chinks that still remain in their armor ahead of the World Cup. Having said that, there are a plethora of records that can be achieved during its course. Mohammad Shami requires one wicket to become the fastest Indian to complete 100 wickets in One-day cricket. Shami has thus far played 55 ODIs and has taken 99 wickets at an average of 26.26 and a strike-rate of 28.52. 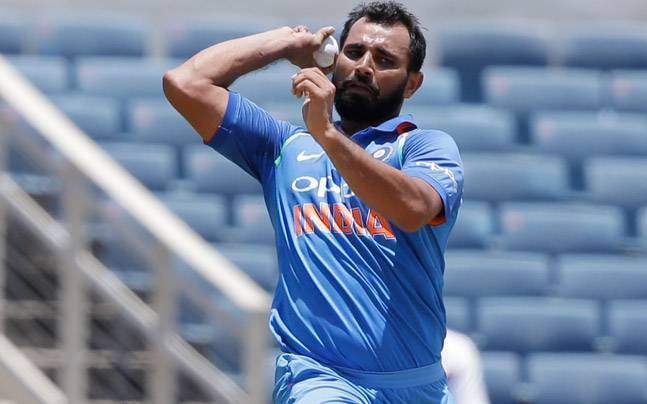 If Shami achieves the feat at Napier, he will become the joint fifth fastest alongside Brett Lee to complete 100 ODI wickets behind Rashid Khan [44 matches], Mitchell Starc , Saqlain Mushtaq  and Shane Bond [54 matches]. Shami recently featured in the ODI series against Australia where he claimed five wickets in three games at 30.20. After being in the wilderness for over a year, Jadeja made his way back into the ODI set-up following Hardik Pandya's injury during the Asia Cup and has been a regular part of the set-up since then. The all-rounder is on the cusp of making history in the ODI series against the Kiwis. Jadeja, who has 171 ODI wickets and 1990 runs to his name, needs just ten runs to become the fifth Indian to complete a double- 100 wickets and 2,000 ODI runs. One-half of India's opening pair, Shikhar Dhawan is on the cusp of becoming the joint fourth fastest batsman to complete 5,000 ODI runs alongside Brian Lara. Dhawan has thus far accumulated 4,990 runs in 117 ODI innings and if he gets the requisite 10 runs in Napier, the Delhi batsman will join the elite company of Hashim Amla [101 innings], Viv Richards & Virat Kohli [114 innings] and Brian Lara [118 innings] as the fourth fastest to 5000 runs. Ross Taylor is at the peak of his powers in ODI cricket. The Kiwi batsman, who averages 69.72 since the 2015 World Cup is on the cusp of becoming the second batsman from his country to score 8,000 ODI runs after Stephen Fleming. Taylor has racked up 7714 runs in 195 innings and needs just 286 more to become the third fastest to cross the 8,000-run mark. MS Dhoni returned to form in the recently concluded ODI series against Australia, scoring three 50s in as many matches to spearhead India's 2-1 win. The former World Cup-winning captain has the opportunity to add another feather to his cap as he requires just 197 runs to become the leading run-scorer for India in ODIs in New Zealand. The list is currently spearheaded by Sachin Tendulkar with 652 runs in 18 matches.